The brightest time of the winter season is coming up, the holiday season. I hope that all of you have done some or all of the activities on this list, but if you have not, try to plan some time to enjoy them in the future. Christmas would just not be the same without them for us. While we do not get to all of these places each year due to time constraints, we try to do as many as possible. This is the list of our favorite things to do and places to experience during the holidays. 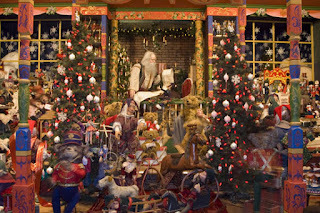 Bar none, one of the quirkiest and most awesome places to visit in the country is Koziar's Christmas Village in Bernville, PA, just south of Interstate 78 in Berks County. This is a special place where family memories are made as brightly as the 500,000 old style, large bulb, Christmas lights that Koziar's uses. Some of my earliest memories were made here. There is nothing like sipping a cup of hot chocolate and walking around this attraction that has been family run and owned since 1948. Make your visit to Koziar's a day trip or an afternoon and evening out, with a visit to Roadside America, just off of Interstate 78 in Shartlesville, PA, Berks County. It is one of the most stunning miniature train exhibits in existence. Operating for over 80 years, this famed William Penn Highway mainstay has captured the imagination of many generations of visitors. Roadside America's miniature train village is 8000 square feet of awesome, and open year round. While we live in Pittsburgh, I (Dave) am originally from the Lehigh Valley. I consider Bethlehem to be my home city. No other city in the entire state decks itself out as great as Bethlehem, the Christmas City. The city was founded on Christmas Eve in 1741 by a group of the pacifist Moravians, led by David Nitschmann and Count Zinzendorf. Every year we go back to the Lehigh Valley and spend Christmas Eve with my family in Allentown. We drive through Bethlehem after spending the evening with my family, and it is always so special. 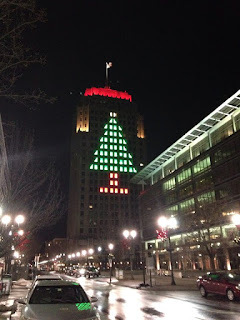 Throughout the holiday season, lights are wrapped around many trees, actual Christmas trees are placed upon every light pole and every streetlight post, giant steel advent wreathes are placed around the city, christmas trees are decorated, and so much more. The Star of Bethlehem, visible for up to twenty miles away, shines as it always does on top of South Mountain looking over the city. Bethlehem's festivities include two German style Christmas craft marts, including Christkindlmarkt and Christmas City Village Weihnachtsmarkt. Other things to do include horse drawn carriage rides, staying overnight or dining at the historic Hotel Bethlehem, browsing at the famous Moravian Book Shop, and so much more. Bethlehem is a place to spend a weekend at if you have the opportunity, especially during the Christmas season. 4) Pittsburgh Light Up Night and Holiday Market. Pittsburgh kicks off the holiday season in the way it knows best, by running a huge fireworks display. Always done the Friday before Thanksgiving, the fireworks, musical performances, demonstrations, and other festivities kick off the holiday season in Pittsburgh. During the festival, many displays set up around the city are lit up for the holiday season, ice skating starts at PPG Place, and so much more. It is always a treat taking in Pittsburgh's Light Up Night Festival and taking in the many holiday displays throughout the season. 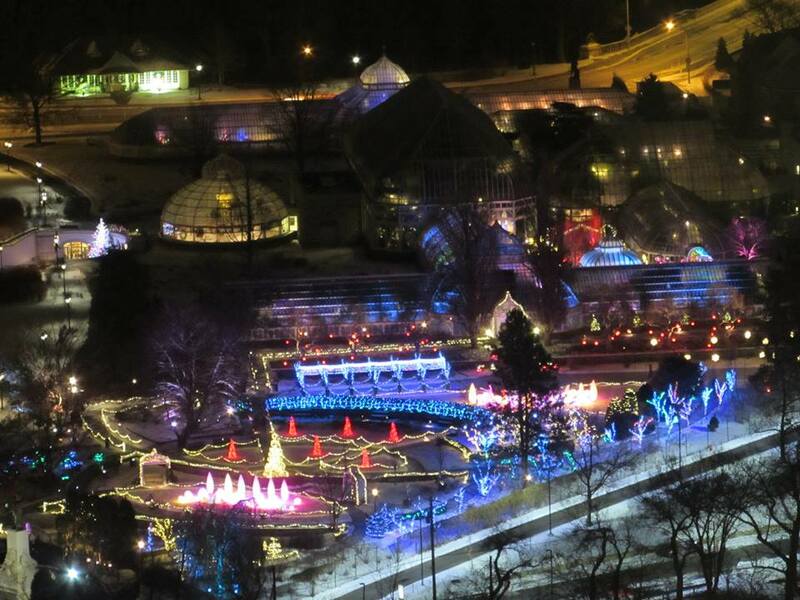 5) Phipps Conservatory and Botanical Gardens Winter Flower Show: Pittsburgh, PA.
Phipps Conservatory is a world class horticultural display garden that really comes alive in the holiday season. Lights and displays are set up throughout the sprawling indoor gardens complex, and outside on the grounds of the facility. This facility is stunning and constantly growing and improving, and dates back to 1893 when it was built by steel and real estate magnate, Henry Phipps. Any time of the year is awesome to visit this place, but one of the best times is during the Winter Flower Show. Longwood Gardens in Kennett Square, PA, is another one of the world's premier horticultural display places. Similar to Phipps, this stunning facility was created by a gilded age industrialist. Pierre DuPont founded the facility, of which many of the buildings within the campus were a part of his mansion. The tract of property dates back to William Penn in 1700 who sold it to the Peirce family. In 1798 they started an arboretum and opened the land for public viewing. Pierre DuPont purchased the land in 1906 to prevent it from getting logged, and he made it his private mansion, of which he kept open for tours of the old arboretum and the new plant specimens that he added to the gardens. In 1946 he founded the Longwood Foundation, an organization that has kept the facility open in his honor ever since. The complex gets intricately decorated for the holiday season each year, with many displays, the thousands of plant and tree specimens throughout the complex, the famous fountains, and the sound of the famous 10,010 pipe organ still entertains visitors as it has since 1929. Longwood is an awesome place to visit any time of the year, but especially during Christmas. If you are going to visit, be sure to contact the gardens to reserve a time to visit. Every year, Allentown closes its Little Lehigh Parkway and creates a drive through holiday display. Lights in the Parkway is awesome! 8) Lancaster: The Strasburg Railroad, and more. Similar to Bethlehem, Lancaster is another awesome area to visit over the holidays. The National Christmas Center museum is an awesome place to experience and barring a possible sale, it will be closing in January. Be sure to check out the museum's incredible collection before it is too late. As with many of the places that we have talked about throughout this article, the Strasburg Railroad is an absolutely awesome place to visit. Cited by many as the best preserved steam train attraction, Strasburg is a must-see attraction for anyone that loves trains and beautiful Amish farm scenery. In addition to the scenic ride you get on their old trains, the trains and route are elegantly decorated for Christmas, and they even run themed holiday train rides. 9) Indiana, PA: Jimmy Stewart Museum, It's a Wonderful Life Festival, and the Christmas Tree Capital of the World. If you were unaware, one of the best actors of all time, Jimmy Stewart, grew up in Indiana, PA. 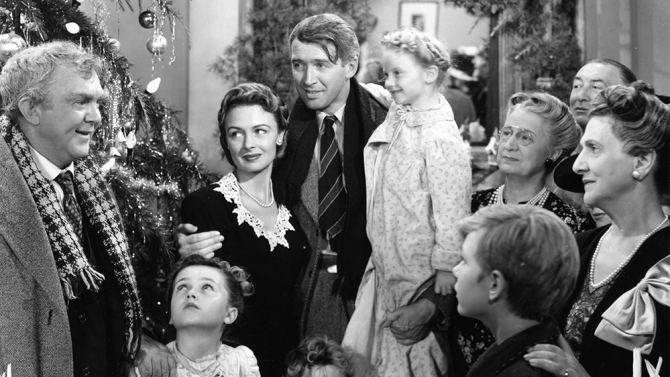 The city is home to the Jimmy Stewart Museum in his honor, which celebrates the career of the legend that brought us one of the best Christmas movies of all time, It's a Wonderful Life. Indiana also celebrates a festival in his honor, with the It's a Wonderful Life Festival, which will be celebrated each weekend from the weekend of November 18th-Christmas. Be sure to come and visit the museum anyways and maybe even cut down a Christmas tree in the area nicknamed the "Christmas Tree Capital of the World." 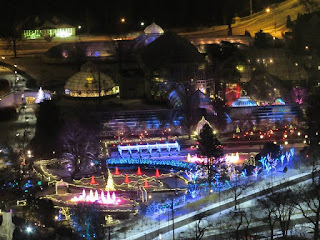 With the park's legendary coasters, the winter hibernation of the world's oldest operating roller coaster, Leap the Dips, and the Skyliner, Altoona, PA's Lakemont Park has a delightful drive-through holiday display. If you are in the area, definitely spend an evening at Lakemont Park. Overly's has a great drive through display, along with a village with displays, food, hot chocolate, wagon rides, and even a bonfire to warm you up! Overly's is a great place to enjoy during the holidays. 12) While you are driving around the state, be sure to keep your eye out for some beautifully decked out houses, including Leechburg Lights, perhaps the most decked out house in the history of human civilization. Tree Farm and Bobwhite Acres Orchard, is our Christmas Tree farm of choice, but there are many awesome places to choose from across the state. This photo was taken a few years ago, so I assume that the trees in this photo are probably ready for this year! Get started planning! If you are looking for a gift for anyone, our book about Pennsylvania Amusement Parks "Great Pennsylvania Amusement Parks Road Trip," is available through the drop down menu at the top of the page, or through this link, along with our 2018 Interesting Pennsylvania Calendar.